Much has been written about the making of “modern Turkish woman” under the Kemalist regime, including the significance of unveiled women and their increasing public visibility. Although little is known about their content and implications, anti-veiling campaigns in the single-party era, which included the banning of the peçe (face veil) and the çarşaf (full body cloak) by local administrations, have been discussed as one of the most powerful symbols of Kemalist oppression and became highly politicized during the headscarf debate in the recent decades. While the official narrative has celebrated such policies as emancipation of women, critical accounts have largely seen women as victims of them. In both analyses, women have been characterized as passive receivers of the state policies. 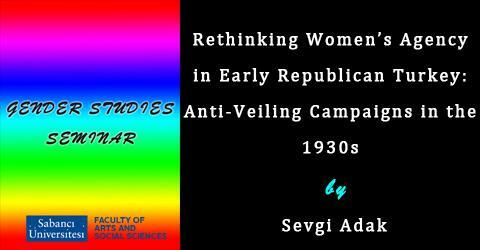 The talk looks at how the anti-veiling campaigns of the 1930s were formulated and implemented, and discusses women’s roles in this process as agents that tried to shape, modify and/or resist state policies. As mainly local initiatives, the campaigns were based on discussions and negotiations in the provinces, and as such, they were shaped by multiple agents. Some women played an active role in the campaigns, not only as supporters but also as initiators of the bans issued by local institutions. Some women tried to resist these interventions in various and quite creative ways, while others domesticated new clothes by adapting them to local circumstances or by embracing new forms of covering their hair. The case of the anti-veiling campaigns demonstrates that the state policies in the single-party era Turkey can be understood fully only by appreciating the multiplicity of actors, and particularly, women’s agency. It also shows that the feminist critique of the early republic has to be revisited and enlarged in order to reflect the complexity of women’s reactions and roles and to restore ordinary women’s agency in the shaping of the Kemalist experience.